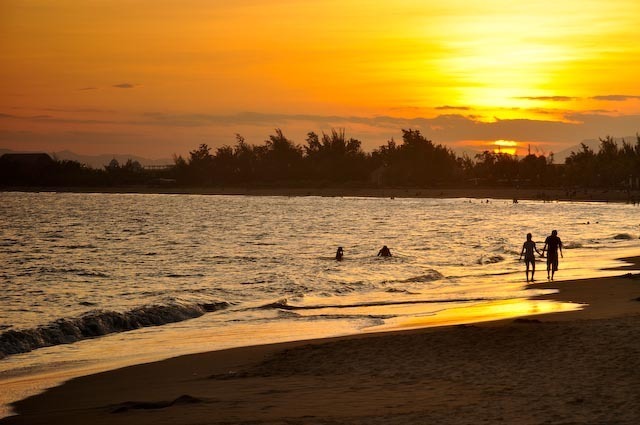 Some litter blights the scene, but the 10km-long beach is attractive and makes a quieter alternative to Phan Rang as a base for visiting the Cham ruins. There are new resort hotels are springing up around the bay. Hotel resorts are scattered along the shoreline. Budget accommodation is concentrated at the north end of the bay, where there’s a fishing village and a row of beachfront seafood restaurants. ( 068-387 3399; s/d 150,000/200,000d) A simple place run by a friendly (non- English speaking) couple with clean rooms, all with TV, fan and air-conditioning. It’s 200m from the north end of the beach. ( 068-389 0009; r 245,000-500,000d) Away from the shore, this roadside place offers inexpensive, good-value rooms with smart trim. It’s a short walk to the beach. ( 068-387 4899; www.congavangresort.com; r 400,000-900,000d, ste 1,300,000-2,200,000d) The room prices here are pretty enticing when you factor in smart, spacious rooms, attractive coconut-fringed swimming pool and tennis courts. The hotel’s beachfront Huong Dua Restaurant (mains 40,000-100,000d) has great value seafood, and service is good. ( 068-387 4223; www.bautrucresort.com; r US$45-140) Formerly the Den Gion, this large hotel resort has a good range of well-appointed bungalows with contemporary bathrooms set in a lush garden by the beach. The pool is huge and breakfast is included, taken at the open-air restaurant (dinner mains 50,000d to 155,000d). Aim for a discount off the rack rates. Turn left (southeast) into Ð Ngo Gia Tu, the street immediately before the Cai River bridge in Phan Rang, and continue on, following the signs for 7km. Unless you’re driving yourself, it’s easiest to take a xe om (around 30,000d) or a metered taxi (70,000d).